According to multiple media reports, a Colorado entrepreneur has created a t-shirt that’s a big hit. The shirt is pretty simple—it’s a white t-shirt with a very realistic gun in a shoulder holster, making it appear as if the wearer is carrying a firearm. CBS Channel 4 in Denver reports the t-shirt is made by a Colorado man named Paul Liebe. Liebe says the design is intended to start discussions about the Second Amendment and allow the wearer to express their views on gun rights. “Freedom of speech, it’s your right, and it just has a little kick on the side,” Liebe told CBS4. If confronted, a wearer should, “Be responsible, obey all orders. … halt, stop, freeze, immediately,” Liebe says. Commenters on the station’s website pointed out that one could carry a real gun instead. “You can do that you know,” said Roger Lawhorn. “Anyone that wears this as a self defense item is a moron,” wrote JP2012. “Strikes me as something akin to wearing an antler hat in the woods during deer season,” said flyovermark. “It’s a shirt, it’s no big deal. Very few people will be fooled by it,” wrote John C.
“Just carry a real gun. 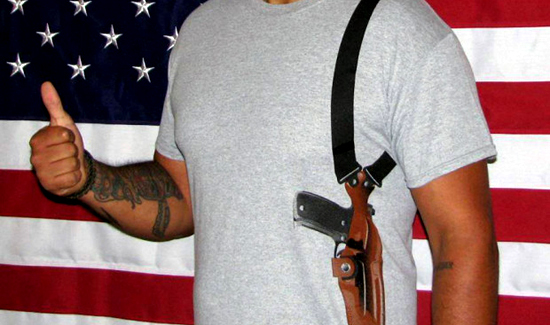 Open carry is legal in most of Colorado – excepting the People’s Republic of Denver/Boulder,” said Nathan Bedford Forrest. At any rate, the shirt’s a hit.